Sometime in the last decade or so, "World War II first-person shooter" moved from being a legitimate selling point to cause for derision. The big franchises that spawned much of the WWII FPS craze--Call of Duty, Medal of Honor, and Battlefield--all decided they'd had enough of The Big One and moved to more modern settings. The genre has been largely dormant since, but CI Games is looking to bring it back next year with Enemy Front. Although it was originally announced in 2011, Enemy Front hasn't been heard from in almost a year. CI Games has been busy overhauling the project with a new creative director, Raphael van Lierop, who did two stints with Company of Heroes studio Relic Entertainment and in between served as the original narrative designer on Far Cry 3. With the new-look Enemy Front ready to be unveiled at Gamescom this week, van Lierop spoke with GamesIndustry International about why the time is right to return to World War II, the changing market for the AAA blockbuster, and the impact of a thriving indie game scene. 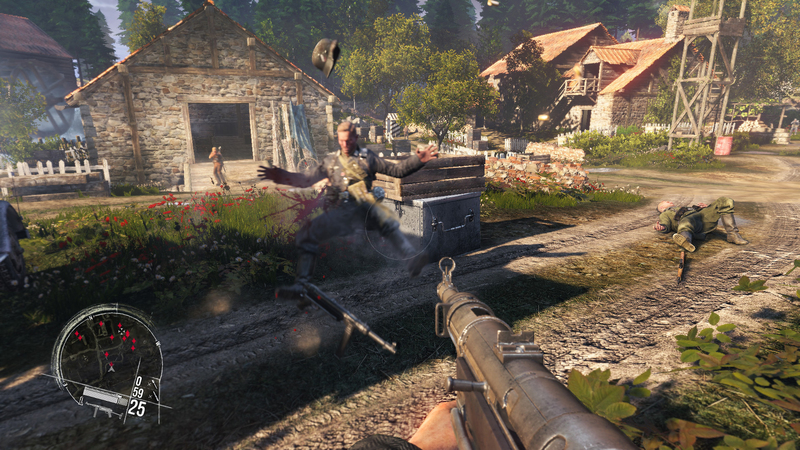 When asked why the World War II first-person shooter fell out of popularity, van Lierop said the market became saturated with people attempting much the same thing. "Games are often inspired by really iconic films, and after Saving Private Ryan, I think a lot of people were really struck by how powerful that film was in its portrayal of WWII," van Lierop said, "and a lot of game developers thought, 'Let's make a game that recreates some of that experience.'" More often that not, that experience tended to be a guided tour through a combination shooting gallery and theme park, with developers trying to evoke the same emotions in much the same ways, at times with the same battles. However, van Lierop believes there's plenty of room to revisit the same conflict with a fresh approach. 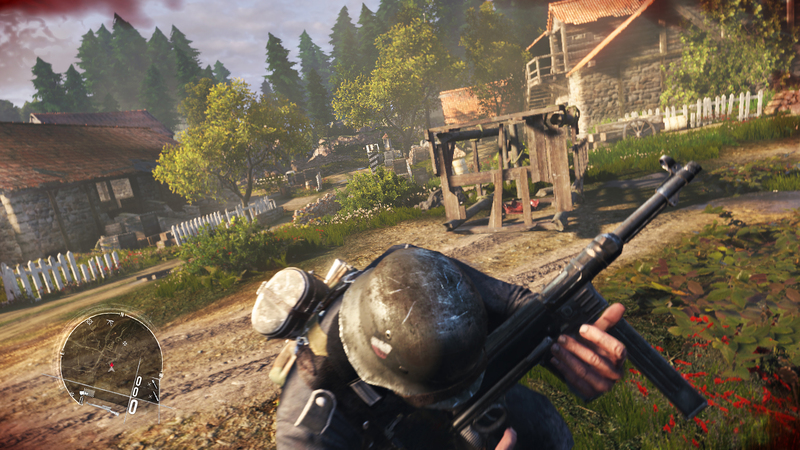 For example, Enemy Front is trying to move away from the grim and dirty desaturated look that Saving Private Ryan popularized with a more vivid visual style, and van Lierop said the gameplay has been redesigned to reflect recent evolutions in the shooter genre. "One of the things we've focused on since I've been involved in the project has been to modernize the gameplay experience, take it out of that older style of really linear game, and embrace more of a combat sandbox approach," van Lierop said. "The levels are quite open, encounters are designed specifically so that players can approach them from various directions and use what we call 'the resistance fighter's toolbox' to get through them." "I think there are a lot of gamers who grew up on the 360 and PS3 who think Call of Duty was always about modern warfare and they never had a chance to play it as a WWII franchise." The story has been tweaked in turn to match that new gameplay focus on asymmetrical warfare. Instead of playing as a soldier simply following marching orders, players will take control of a "Hemmingway-esque" war correspondent who gets involved with the Polish resistance (a bit of WWII history that has largely gone unmined in WWII shooters, but one that holds considerable significance for Warsaw-based CI Games). But it's not just shooters that have grown in recent years. As van Lierop points out, it's gamers as well. "I think there are a lot of gamers who grew up on the 360 and PS3 who think Call of Duty was always about modern warfare and they never had a chance to play it as a WWII franchise," van Lierop said. "So I think there's an audience there--a younger audience, maybe--that's ready to go back and experience that. And there's an older audience like myself, people in their mid-30s who played all those franchises when they started out as WWII games, who are getting a bit burned out on the modern warfare thing because we've been doing that for a while." The revamped Enemy Front takes a more sandbox-like approach to combat. While Enemy Front is a new IP set to launch early in the next-generation of systems, van Lierop said the team is currently just focused on versions of the game for the Xbox 360, PlayStation 3, and PC. As for the notion that early on in a system's lifespan is the ideal time to release new intellectual properties, van Lierop brushed that worry aside. "That would be a concern if hardware were really the limiting factor," van Lierop said. "I think here, audience size would be more of a concern, and launching on the next-gen consoles with a new IP when there's a small install base is not necessarily the best recipe for success either. I think certainly the best approach is to launch on everything. The game is based on CryEngine 3 technology that is optimized for the current-gen consoles, and I think we're a ways away from anyone outside of Crytek being able to ship a CryEngine game on next-gen platforms." "[Big-budget AAA is] no longer where we're necessarily going to see the most interesting work being done. Let's put it that way." Either way, van Lierop knows there's no shortage of competition in the industry. He acknowledged that everything is competing for players' eyes, ears, time, and money, from retail console games to digitally distributed titles, mobile games, and free-to-play browser-based offerings. All of these things have helped expand the total player base, but the diversity of experiences has created some angst about how well the old model can survive in the changing market. "I fear somewhat for the blockbuster because I don't know that the business model of the $100 million console games really makes sense, for new IP at least," van Lierop said. "We've got a series of well-established franchises that people feel confident dropping $60 on without too many questions, but I think it's really hard to break into that category. To do that you need to come up with something fresh and unique that has a different point of view, and hopefully we'll be able to do that with Enemy Front." While van Lierop likens the game to a AAA title with AAA talent, it's not being created with the typical sort of AAA budget. "One of the things that's interesting for me is working with a smaller-scale, independent publisher/developer in Eastern Europe, where you can do a lot of stuff with a smaller team for less money," van Lierop said. "So you can take more creative risks. You can do things you can't do with studios in North America and big established franchises that people aren't willing to take a bet on making significant changes to them because the formula works really well and there's a lot of money riding on it. But that's no longer where we're necessarily going to see the most interesting work being done. Let's put it that way." 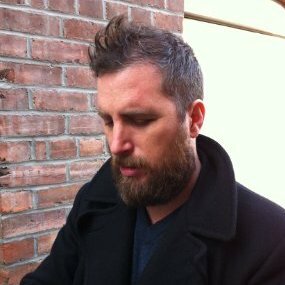 Some of van Lierop's favorite game experiences in recent years--Capy's Sword & Sworcery EP, thatgamecompany's Journey, and Telltale's The Walking Dead among them--have been created from outside that model. "I think what we're seeing is there's a lot more power being put in the hands of the independent studios to be self-determining and benefit from their own hard work," van Lierop said. "And that's exciting from a developer perspective." When did killing Nazis become unfashionable? Unfortunately for the AAA market, that excitement is luring a lot of exceptionally talented people away. "You'd have to be blind to not see that's the case," van Lierop said, "There's a huge trend right now of people who've worked in the traditional industry on AAA projects wanting to strike out and be independent and do their own thing, even if that means they don't get to work on huge franchises with huge budgets." van Lierop counts himself among those developers, as he's working on Enemy Front as an independent creative director. He's determined to make the best version of the game he can, but he's not actually an employee of CI Games. "To me, that's a symbol of how highly I value my creative independence and the ability to work on things that are interesting to me," van Lierop said. "At the end of the day, I think most creative people value their independence enough that they are willing to strike out and take risks and do different things, even if it means they don't get to work on the Call of Dutys and the Halos, Assassin's Creeds and other huge franchises." While there might not be a well-established paradigm for such a key role being occupied by an independent contractor, van Lierop said it's not that much different from the way a number of big-name creators represented by talent agencies work (though he carefully specified he wasn't trying to consider himself in the same class as them). "They may have interesting employment agreements with publishers and studios, but ultimately they're independent," van Lierop said. "Let's be honest, we all are. That's part of the problem in the industry is that we forget in the end that we are independent creators and developers. We get too caught up in the idea that it's employment and a job. A lot of people put up with a lot of stuff they probably shouldn't because that's the way they approach their work." Enemy Front is set for release in 2014. Looking forward to a new WWII game. Loved Sniper Elite V2 because it was set in WWII, I still go back and play the first call of duties and Medal of Honor games on PC and X360, and although I do like the newer CoD & BF games a lot, it's still nice to be able to get back to basic warfare that consists of a soldier, his kit and his skills.. Looking forward to Enemy Front's release..